When thinking about your company’s fleet and your operations, there are two things that you should be immediately concerned with: increasing safety and reducing liability. By adding a camera system with DVR recording capability to film your work zones, you can significantly reduce your company’s liability in the event of a collision and, if used properly, you can increase your company’s safety in future operations. How is the recorded footage saved? The recorded footage is captured on a solid state drive (SSD), which is securely stored directly on the truck. What does this mean for you? Compared to hard disk drives (HDD), solid state drives are much more durable. In fact, Ingram Micro Advisor goes as far to say that, “Because SSDs have no moving parts, they are quite shock resistant. They can survive better during your daily commute and travel, withstanding up to 1500g during operation.” This means that the stored footage on the SSD will stand up much better to the turbulence of a collision or any movements in general. How can I watch the footage? If your fleet contains many trucks, you can watch footage from every single one of them from one location live through online fleet tracking software. This gives you the control to not only see video from every camera from every truck instantly, but it also allows you to see the location of each truck. An additional benefit of this software is that it can alert you of a collision or if one of your connected trucks is speeding, giving you an additional level of control over the trucks in your fleet. The live viewing does not come standard with the camera package and DVR system, though. Per truck, you can expect to pay $299.00 for a 4G LTE modem as well as approximately $40 per month for a 1GB data plan and server maintenance. The easiest way to watch the footage is by exporting it from the system onto a USB drive. Once the video is on the USB drive, all it takes to watch it is to plug it into any computer and open the file. Another way to watch the footage is to open the DVR system, unlock the solid state drive, and remove the SD card. From there, all you need to do is plug the SD card into a computer and open the file. The final way you can watch the footage mainly applies for if you want to view less recent footage captured. You would need to remove the SSD tray from the DVR system and export it to a computer using an adapter. Is the footage recorded in high definition? The video is recorded in 1080p definition, meaning that you should be able to see many small details, such as license plates or signs, that may not be distinguishable in any lesser resolutions. Why should I put a camera system with DVR recording capability on my trucks? 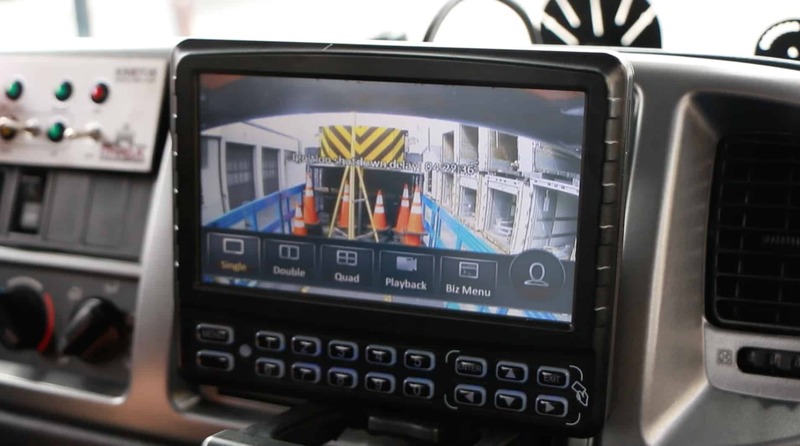 Here are the 2 main reasons why your company’s trucks should be outfitted with a camera system with DVR recording capability to film your work zones. According to the Federal Highway Administration (FHWA), a crash occurred in a work zone once every 5.4 minutes across the United States in 2015. Year-after-year it is becoming increasingly likely that it is not an if but a when your TMA truck will be struck in a work zone. With a camera system on your truck you can record all the actions around it leading to and following a collision. With its high-quality definition, it can capture details such as the offending vehicle’s make and model as well as, potentially, its license plate. This is important because hit and run accidents in work zones frequently happen. Being able to record and capture these major details will help your company avoid liability in these types of collisions. Another benefit area is in the event of a collision, you can prove that the work zone was set up properly and that the operation was done correctly. With one camera facing in front of the truck and one camera facing the rear of the truck, you can capture the entire work zone set up. This is area in which being able to prove everything was done correctly can significantly lower your company’s liability in the event of a crash. The video footage captured and saved on the DVR recording device can also be used for internal review. While the camera system reduces your company’s liability in external incidents, such as collisions, it can also increase your company’s safety and efficiency as well. Because of its ability to store footage from past operations, you can watch the footage after the fact to ensure that your work crew is operating safely and is doing the operation correctly and in the most efficient manner. In this sense, these video recordings serve as an excellent training tool for new employees, as it shows them exactly what type of operations they will be undertaking. This also is a great tool to serve as a check for current members of the work crew to ensure that they are doing their job properly and abiding by the latest safety measures. Having a camera system with DVR recording capability to film your work zones is beneficial to your company in many ways. Not only will it reduce your company’s liability in the event of a collision, but it can also be used for internal review of employees, allowing you to train new employees and ensure your current work crews are operating safely and efficiently.